Since four days the popular peace movement have been setting up a sit-in tent beside the American embassy saying until we have not contacted with the US congress and people, we will stay here and continue our move. In a conversation with The Kabul Times reporter, the leader of this popular movement Eqbal Kheyber said, we plan to send a letter to US congress and people and ask them to conclude the war. He added, that they have talked with a number of Afghan born Americans in the US and demonstrations are expected to be launched in support of peace movement in the US. The members of this movement have walked many days to say “No” to war and ending of violences in the country and now for nearly two weeks they have been raising their peace-loving voice in the capital city. They believe that the Afghans have been fed up with war and want to share their pains and sufferings through this popular movement and force the warring factions to give up war. The members of this movement are expected to set up sit in tents near the Russia, Pakistan, UK and Iran embassies in Kabul in the wake of achieving their expected goals from the US embassy. 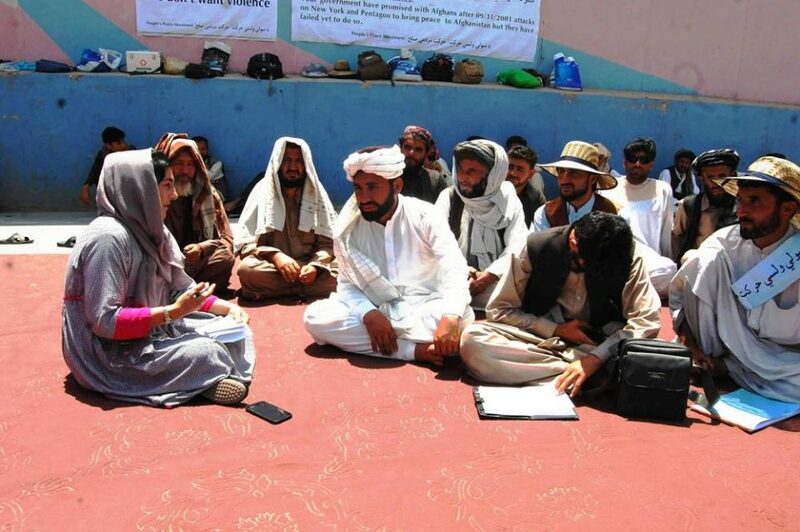 According to Eqbal Kheyber, they started their movement with seven partners in Helmand province and talked with the people in the provinces in which their were wars and gradually their number increased. Touching similar peace movements started in Kunar and Logar the leader said these two movements which included widows joined us and we don’t absorb unpopular and artificial movements which are not adaptable with our rules. Eqbal Kheyber went on to say, after our moving from Helmand, in our course to Kabul, we walked with Taliban as they shared their anecdotes with us. They were fed up too with war and wanted an umbrella to be prepared under which they would take refuge and lead a dignified and peaceful life. Eqbal went on to say, Taliban said that nothing is in our option. They even cried that they don’t know their breakfasting. There are war and clashes. They afraid and said that they have been stranded in a net now, a solution should be found to rid us from it. There was another group among Taliban that debated with us until late night and said that Afghanistan conflict could not be settled through war. We should find another way skillfully in which either ours or Afghanistan dignity would be safe. They agreed and supported us. On our way, we visited ANA and ANP. They said they are also fed up with war and this situation must change. He went on to say, we saw the people were very poor and destitute and tired of continued devastating wars. We potentially saw that the Afghan people hate the war and want to live in people. According to Eqbal, there are people among Taliban who don’t want the war to stop because the war is in the benefit of their supporting countries. We told them to start struggle among themselves first and draw the aliens away. Then you can start negotiation with the Afghan government deliberately. 2- Fixing of negotiation offices. 3- Establishment of a common system. 4- Making schedule of withdrawal of foreign troops. At the moment our policy is sitting-in-tents near embassies. We don’t talk with officials of embassies. They know the situation potentially we have nothing to share with them. We want to contact with their people and share the real picture of Afghanistan with them.